A limited-edition dual-sided Select Moisture Concealer featuring two tones to help conceal blemishes and correct dark circles under the eyes. Line softening, moisturized finish makes it ideal for undereyes. I bought this for a bunch of reasons: I have dark circles, and I have deep-set eyes - trust me, it's a bad combination. I needed a coral-based concealer for the dark circles and a more yellow one for lightening. 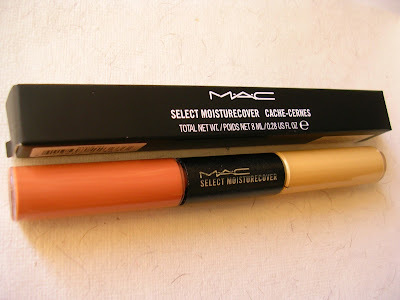 I had planned on buying two separate products from another brand, when this collection launched, and the concealer seemed made for me :P :P The cost was another reason. Buying two separate products would have cost me more. makes it easier for me to figure out how much to use of each corrector. It's perfect for people who have not been able to find a suitable shade of concealer - like me, I need two separate shades to get a proper effect. I mix and use for concealing, then use a bit more of the yellow to make the area look a bit brighter. I mix it on the back of my hand, and I end up wasting a lot of product that sticks on to my hand. It's a limited edition product, so if you love it, and you run out of whatever you have stocked up - uh-ohhh!!! i have never seen this type od concealer! great to know about it, bt i think it will need practice to attain desired results.. It is just so amazing na..I saw that MUA using this on Priya, and it reallyyyyy did make the difference. I so much wanted to buy it, but then thought that I anyway dont have that much patience to mix and match and get perfect shade all the time.. and now Yash is anyway multi tasking as a concealer for me!! he he he he!!! Heheheee...I saw nangu girl pic..she was not nangu at all..this Jomol naaa!!! But this concealer did make a loootttttt of difference on priya..her face suddenly started looking so fresh and it sooo well hid the dark circles.....and it was looking really easy peasy..the mua first kept on aplying orange orange and then yellow on top and mixed there only..he he...!! :D :D ..Its really buildable and suitable for all skin tones!!! :( I thought I could some how manage to start early..but everything got delayed! :( And the traffic was so horrible..it gave me headache in reaching home only!!! Just got an sms from Priya..she got her makeup done by Mickey Contractor!!!!!!!!!!!!!!!!! RADSSSSSSSSSS...we should have gone!! :( :( My headache still not gone..but the pics are soo aweeeeeeesomme!!! I am totally droooooooooooling over them!! He does look quite friendly naaa!! So Siahi, concealer and what more ???? Nice review..Think it will work for me too..I have dark circles (read wearing glases for almost 20 years) :-((( and my complexion is fair but a bit pale kinds..Do you think it will work, Mrs. Rads..? nice review! i realy wanted to see it all mixed and all.. so thankoos.. but soo much product will get wasted na! btw is it easily blendable? Prachi - I would recommend this only for people who cannot find their match in regular concealers - only because it involves some amount of mixing to get the desired colour, at least for me.